Crystallized in rhombic Crystal structure as plate tablet lamellar crystals with perfect cleavage. Billietit - radio-active oxide; his color changes from succinic-yellow to light-brown. Billietit is exceptionally alike on the physical properties and external type on a becquerelite which is fully analogical him only that in a formula substituted for a barium a calcium. Radio-active. 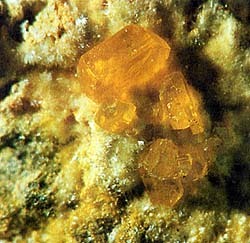 Billietit appears as an oxidate Uraninite is in superficial terms. As beautiful crystals found out Billietit in the province of Shaba in Zaire; in some places of Europe, for example, Mencenshvandv Shvarcvalde (Germany) or Utelup, Steep and found out Marnyak (France) enough interesting, exact crystals in an association with Uraninite and uranocircite.